Trotec Laser, Inc. is offering a trade in allowance up to $4,500 off the purchase of a new Trotec Laser when you trade-in your old laser machine! SO HURRY & CA$H IN ON YOUR CLUNKER TODAY! 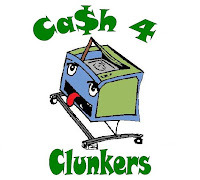 Due to popular demand, Trotec Laser, Inc. is extending our CA$H 4 CLUNKERS program! That's right! We're giving you more time! You now have until December 15, 2009 to trade in & cash in on your old laser machine!